We are are here for you. Dr. Jatin Patel is experienced in dealing with dental emergencies and will put your mind at ease with his calming nature. 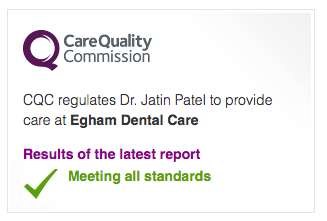 Egham Dental Care provides a professional service, which is solely dedicated to the patient at hand. We understand that every emergency patient with dental concerns is unique in nature and requires undivided attention. Our emergency dental care service is designed to cater for everyone, including the young, elderly and disabled. Our aim will be to put the patient at ease and relieve pain by providing treatment as necessary. We understand that in emergency situations you may be anxious and concerned. Dr. Patel is highly skilled in providing emergency dental care sympathetically and professionally. Follow up treatment can be provided if requested at a later date. Prior to any treatment being done, all procedures, costs and appointment planning will be discussed with you. Our Emergency Dental Care service is not restricted and is available to those locally and nationally, whether you are from Staines, Virginia Water, Ascot or Windsor or further afield in the rest of Berkshire and Buckinghamshire. Dr. Patel is on call 6.00PM – 10.00PM Monday to Friday and 9.00 – 1.00pm Saturday/Sunday and Bank Holidays. You do not have to be a registered patient at our practice in order to receive emergency dental treatment. The practice accepts all types of insurance members. If you wish to book an emergency dental appointment, call either 01784 472444 (during opening hours) or 0800 619 8144 (outside opening hours). Your call will be answered by a member of the team at Egham Dental Care, where details will be taken and an urgent dental appointment time will be given.